"About 80% of vacationers ask me how I cook seafood now compared to when I lived in Minneapolis, Minnesota. I tell them, not much has changed except that I am a much happier cook. This recipe is sure to be a hit around your dinner table this holiday season! Serve with pasta or rice." I thought this was nice, but the shrimp kind of overwhelms the lobster. Shrimp and lobster end up slightly over cooked when following the steps. Next time we make it the mushrooms will be cooked before adding the shrimp and lobster. 5 stars! First try with family gathering, I received raves.onily change was a spicy Caribbean sauce. ( only because that was what we had on hand) I have saved this to favorites! 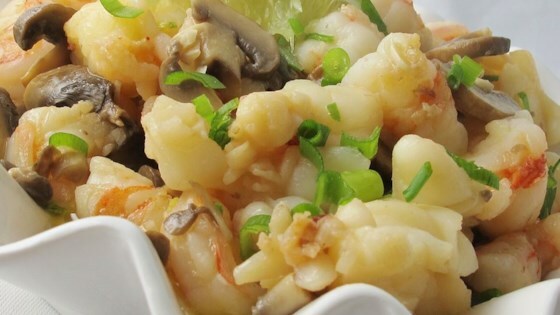 I excluded the lobster tails from this recipe because I do not like the taste of lobster but this dish was delicious, and fast to cook, definitely recommend!